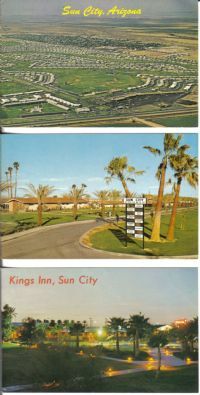 Here is a super collection of seven 50's postcard views of Del Webb's Sun City development near Phoenix Ariz. These nice 50s postcard feature early views of this retirment community on US Route 89, about 17 miles north of Phoenix. Included are views of Coffee House, Dining Room & Cocktail Lounge, Directory sign and homes, aerial view of community, welcome sign and fountain, shuffleboard courts, band shell and picnic area and the Sun Bowl band shell. I see 50's autos in view, so assume this planned community was built around that time. Back of cards are all postally unused. Condition is mint! Any other lines or waves are from the scanner and not on the actual image. Your item is shipped to you safely in a rigid mailer. #201 RP Old Plank Rd Hwy 80 Yuma AZ !!! Here is a neat old RPPC from Arizona! It pictures a vintage auto riding along old Highway 80 at Yuma. A piece of old Plank Road is visible crossing under the highway. The back is undivided and postally unused with an EKC Place Stamp Here Box. Condition good with crease at lower left edge as shown. Dates to the 1940's ?? ?